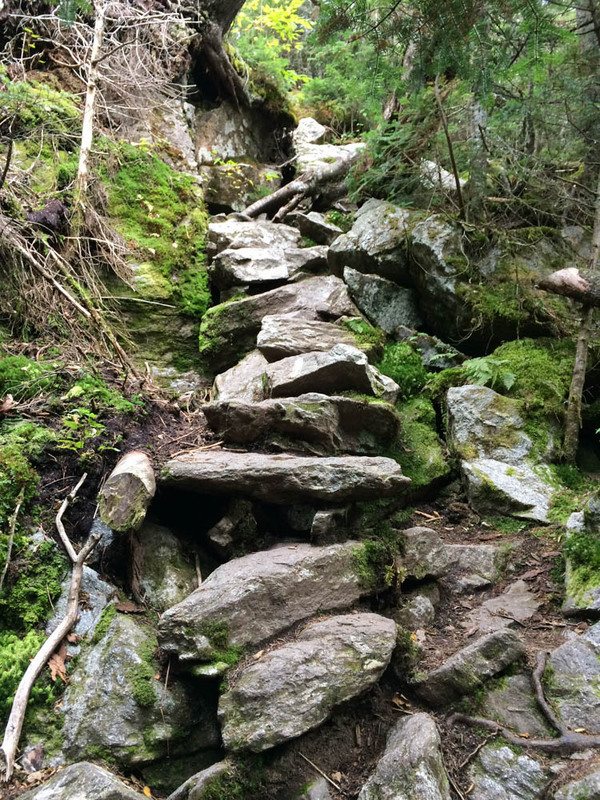 An example of the rugged trail along Wildcat ridge, and the impressive rockwork needed to support hikers. It’s even steeper than this photo makes it look! I had the honor of accompanying my dear friend Lelia on a two-day backpacking trip across the Wildcat and Carter range, in the eastern part of the White Mountain National Forest, to complete her list of 48 four-thousand-foot peaks. We managed a late start on Friday afternoon, heading steeply out of Pinkham Notch from Glen Ellis Falls to scramble up the Wildcat Ridge. This route fortunately provides some nice views of the Notch, and eventually of the Presidential Range, though it spends most of its length deep in the scrubby trees of a New Hampshire ridgeline. The ridge is rough, with many ups and downs and scrambles around boulders. We enjoyed the late-afternoon sunshine, and reached the rocky outcrop known as Wildcat D as the light began to fade. I paused here for a moment to reflect on my own journey to the 48 peaks, which I had completed here – on this very spot – 20 years earlier. A morning view into Carter Notch, with the hut and ponds visible at bottom, and Wildcat ridge behind, from an outlook on the climb up to Carter Dome. We could just barely see our destination down into Carter Notch, in the dim light, and began to scramble down the steep and jumbled blocks of the trail into the notch. I finally gave in to the need for headlamps, and we pushed past the creaky door of Carter Notch hut, well after dark, to the warm and relieved smiles of Lelia’s husband and son. 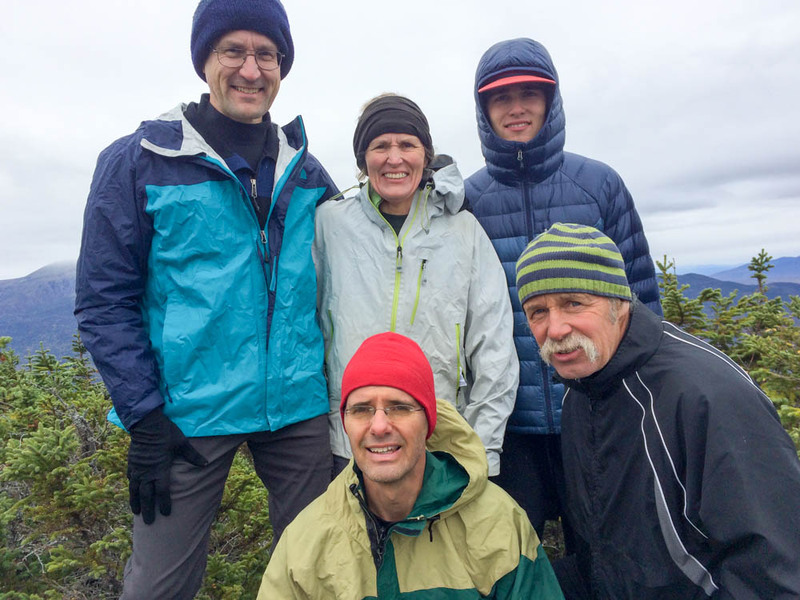 Celebrating Lelia’s 48th NH 4000-footer on Middle Carter mountain with the Presidential Range behind; with David, Lelia, Will, Lars, and Bill. The next morning broke a bit cloudy. Concerned about spending a day hiking through drizzle, we clambered up the steep slope of Carter Dome. Right on schedule, we met another friend – a veteran 4000-footer himself – and continued along the ridge. On Middle Carter we cheered Lelia’s 48th peak with cheese and crackers and celebratory beverages. Her thirty years of determination and perseverance paid off! The weather had held out nicely, and we had fine views of the Presidentials to the west and the Maine peaks to the east. 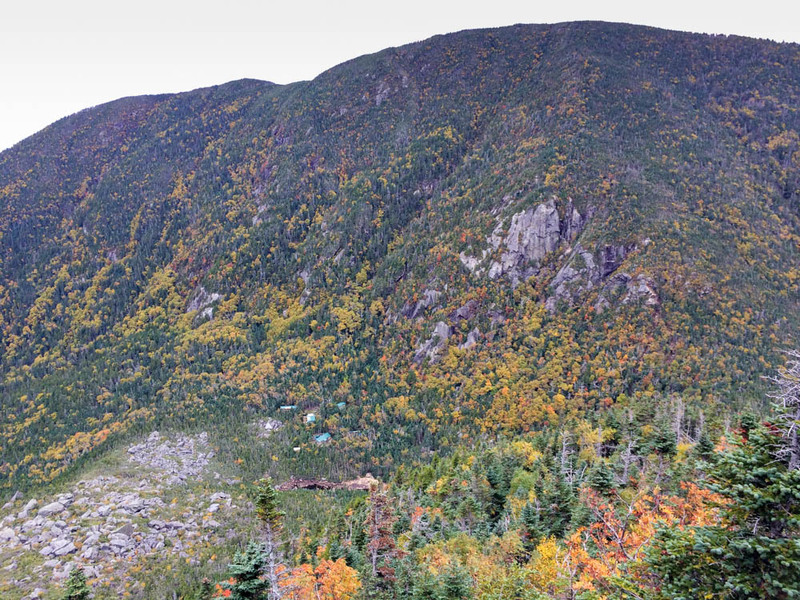 We scampered down the Imp trail into the Notch, enjoying the bright colors of fall, and capped off a fine weekend with a hearty dinner at Pinkham Notch camp.